Lindsay Jasperse and Milton Levin collect hemolymph from eastern oysters for use in immunological assays. On April 10, 2010, the oil drilling rig Deepwater Horizon exploded and sank in the Gulf of Mexico, killing eleven workers. According to the EPA, it was the largest spill in the history of marine oil drilling operations, where over a period of several months, more than two hundred million gallons of oil flowed into the Gulf, necessitating the use of nearly two million gallons of the oil dispersant Corexit®. 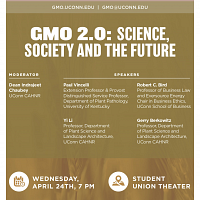 The spill motivated Sylvain De Guise, professor in the Department of Pathobiology and Veterinary Science and director of Connecticut Sea Grant, to assemble a team to assess the impacts of oil and dispersants on oysters. The project was funded through the Morris Animal Foundation. Oysters serve a vital function to the ecosystem as they naturally filter the water as they feed, but because they are immobile, they are also at greater risk from environmental contaminants. 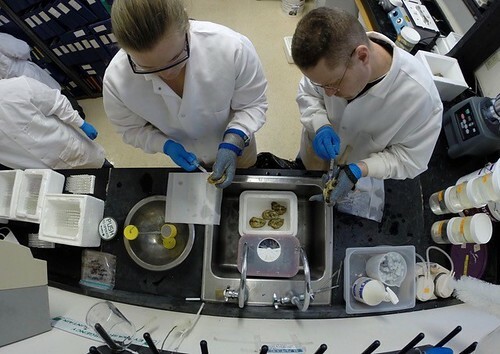 “We wanted to know the effects of three contaminants on eastern oysters—the crude oil, the oil dispersant Corexit® 9500 and a combination of oil and dispersant,” says Lindsay Jasperse, Ph.D. student. The research oysters were collected in Connecticut; however, they were the exact same species—eastern— as is found in the Gulf. “We wanted oysters that were not exposed to oil so that we could control their first exposure in the lab,” Jasperse explains. The team also assessed oyster tissue histology, searching at the microscopic level for any signs of disease, such as inflammation or tissue necrosis. While the histology tests proved normal, the immune research showed subtle sub-lethal immune function changes, specifically with the dispersant exposure. The dispersant and oil mixture showed a lesser degree of immune change, and the oil alone did not prove to affect these immune functions. 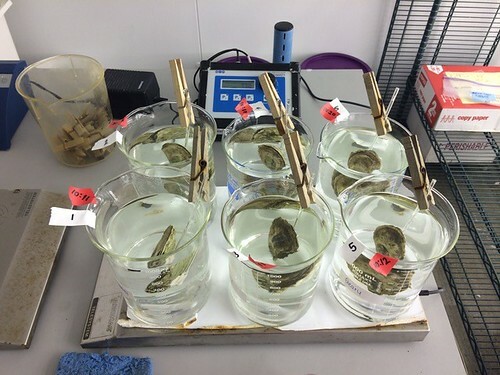 When testing how well the oysters could filter phytoplankton (their food) from seawater, they found that all three exposures significantly reduced the ability of oysters to feed, but the dispersant/oil mixture had the most drastic results. What this tells us is there is a trade-off when using these chemicals. The dispersants separate the oil into tiny particles that move with the tides and sink into the water depths, distributing it throughout the ocean. This keeps the oil slick from settling on the coast, where it is toxic to other animal life, such as birds and fish, and aquatic plants. But when the dispersant is applied, the oil and chemicals reach the oyster beds, and the oysters cannot move to escape the potentially toxic exposure. 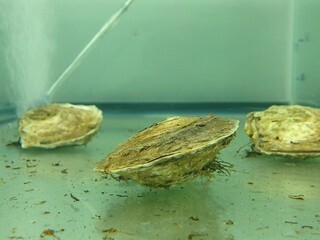 Measuring the effect of exposure on eastern oysters’ clearance rate of bacteria from the water. 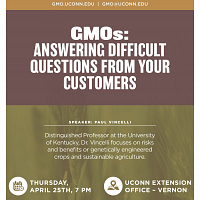 In addition to De Guise and Jasperse, the team included Milton Levin, assistant research professor; former undergraduate student Katherine Tsantiris; Evan Ward, professor and department head of Marine Sciences at Avery Point; Christopher Perkins, academic assistant at the Center for Environmental Science and Engineering, and Roxanna Smolowitz, director of the Aquatic Diagnostic Laboratory at Roger Williams University. 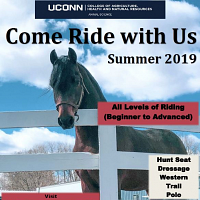 This entry was posted in Animals, Environment, Faculty, Pathobiology, Research, Stories.